Usually with chain restaurants, you are left at the hands of a stock formula and the chef on duty that particular night. So I tried my best to give the most accurate judging based on the overall circumstance. I ordered half of the “bone-in” wings and half of the boneless to get it all in at one shot. I had them come with the “Classic Buffalo” and ordered the “Inferno” on the side to amp things up. I must say that the overall presentation was less than appealing. 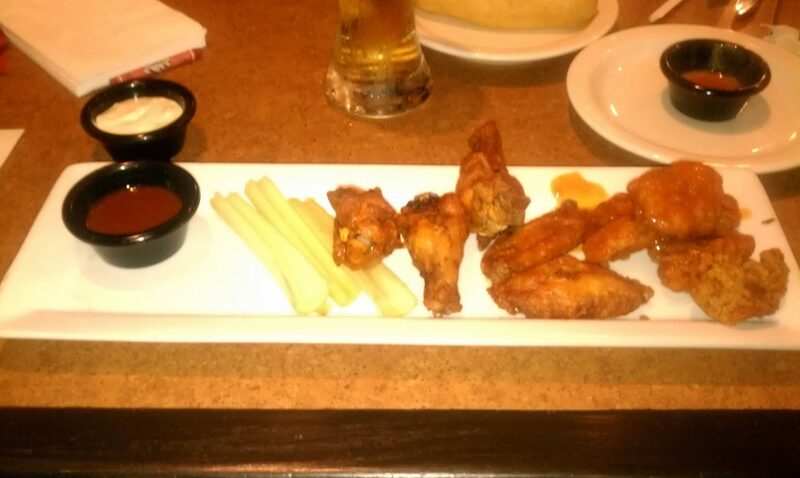 The wings looked a bit overdone and the plate looked a bit scarce. It came with a side of celery which is always a good companion, and it was a relief to find them crispy and watery like a good side should be. The regular wings were small in size and had very little meat, but I was pleased to find them crispy and not too dry (notice that I said “too dry”). The “Classic Buffalo” was slightly tangy and had a sweet hot punch that resided in my mouth afterward. The “Inferno” was pretty much the same sauce only it up’d the heat and up’d the tang. Did it burn me silly? Not a chance, but it did get me sweating a bit. I just think that with a name like “Inferno” it would be hotter than the fiery pits of hell and it wasn’t, thus falling a bit short. The atmosphere was fun, but the food was horrible. However, there may come a time in which you are craving a good wing but find yourself forced into saying “I do” to this establishment. In that situation, my advice would be to order a round of bread sticks, dip them in the “Classic Buffalo” sauce, and order yourself a steak.